Didier has continued the family tradition by taking the 26 hectare estate, Domaine Berthoumieu, to the top of the Madiran appellation using Tannat, Cabernet Sauvignon, Cabernet Franc and Pinenc. For white wines (15% of total annual production of 160,000 bottles), Didier makes some of the best Pacherenc du Vic Bihl using Petit Manseng, Gros Manseng and Petit Courbu. Around 15,000 cases are made each year. The vineyard is managed in a “reasoned” way: Didier has applied the Tonyx method for more than a decade, using natural trace elements to strengthen the vine's protective defences thereby making it more resistant to diseases. Other treatments can then be limited. Qualitative management is ensured through various practices undertaken in the vineyard such as thinning out the leaves to get the best maturation possible and green harvesting to limit yields. 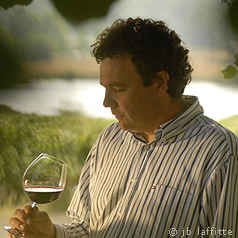 Unlike many other Madiran winemakers, Didier does not use micro-oxygenation to tame the tannins; instead he racks intensively and uses new oak to add sweetness to the burly wine. As such, they are even more approachable in their youth but age impressively too. Elsewhere, Didier makes Pacherenc de Vic-Bilh: a crisp, fresh, grapefruit-scented white and sweet, rich, aromatic Doux, "Symphonie d'Automne". In addition to the Berthoumieu range, Didier also makes a very good, accesible Madiran under the Domaine Lacassagne label. These are wines widely regarded not only for the pleasure they undoubtedly give but also for their health benefits: when consumed in moderation (of course), Tannat-based wines are considered to be at the heart of the French paradox (see Roger Corder's The Wine Diet). The high fat content of the South-Western diet (lots of duck and foie gras) is, it seems, countered by the high procyanidin content (higher than any other variety). Dr Corder recommends around half a bottle for men and a third for women to be consumed daily with food. He describes Berthoumieu's "Charles de Batz" as one of his favourite Madiran wines and gives it an outstanding ♥♥♥♥♥ rating which means a 125ml glass has at least 120mg procyanidins, the polyphenol he has identified as being responsible for the French Paradox. Berthoumieu's "Haute Tradition" gets a ♥♥♥♥ rating (90-120mg procyanidins). For more about this, I thoroughly recommend reading Dr Corder's book or for a summary, read my notes from a lecture I attended - see here.